Reduce: Decrease what you buy and throw away. Reuse: Use items more than once. Reclaim: Buy products made from recycled content. (Buy products with the highest percentage post-cosumer waste possible. Post consumer waste are materials that have been previously out in the market and are being recycled. Pre consumer waste are materials used internally by a company. #1 & #2 - pop bottles, detergent bottles, etc. #4 - used in plastic bags and flexible containers. Bags should be returned to store collection areas. #6 - Polystyrene (styrofoam) is not cost effective to recycle. Some pilot programs exist (call around or simply pass on buying this). #7 - Other plastics, most not currently recyclable. Many of your products that are not recyclable through curbside collections are still recyclable; it just takes a little more work. There are plenty of options for all those non-recyclables. Call your local solid waste agency to discard of household waste and electronics. Don't forget you can also try to donate your items through companies like Good Will, Salvation Army and many local churches. Try to sell your items to stores like Plato's Closest and other resale stores. Try to buy second hand through thrift stores such as Love Thrift. 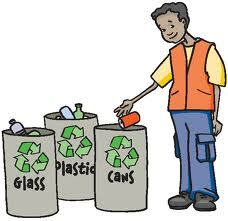 If you all do our part we can help make a difference... Do you recycle?